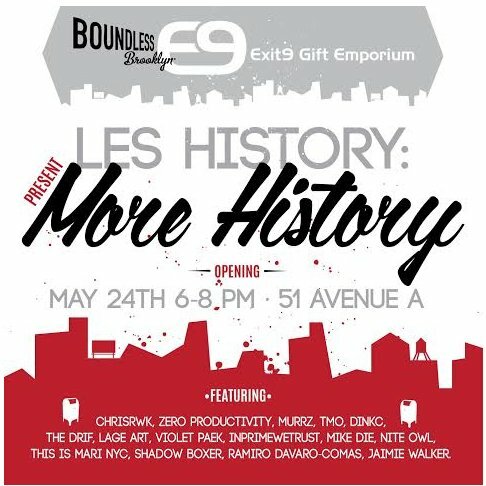 Exit9 is proud to be in cahoots with Boundless Brooklyn®, makers of eco-friendly, do-it-yourself replica model kits, as we curate and present their latest group art show, LES History, More History. The art opening will take place at Exit9 Gift Emporium (51 Avenue A between 3rd and 4th streets) on May 24 from 6-8pm. All art work will be on display and available for purchase until June 24th. LES History, More History will feature original works by approximately 15 of today’s leading NYC artists. In celebration of New York historical icons (including Boundless Brooklyn’s newest product release—Mailbox model kit), each participating artist received a model kit to use as a canvas. The result is a unique collection of three-dimensional works of art that pays homage the disappearing icons of New York's visual landscape. Participating artist include: ChrisRWK, Zero Productivity, MURRZ, TMO, DINKC, The DRiF, Lage Art, Violet Paek, InPrimeWeTrust, Mike Die, Nite Owl, This Is Mari NYC, Shadow Boxer, Ramiro Davaro-Comas, Jaimie Walker.